Yay! it's my turn on the Scrap Book Secrets blog hop. Scrap Quilt Secrets is the new book by Diane Knott of Butterfly Threads blog. 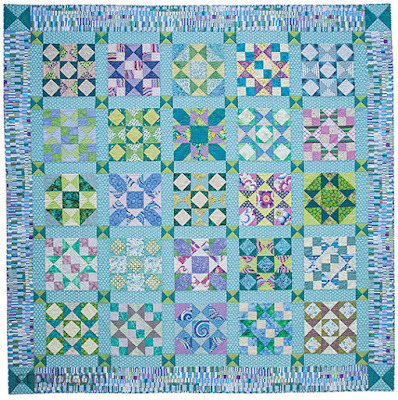 Her blog is full of beautiful quilts and handy tips presented in a friendly cheery way. This book has very much the same happy and helpful vibe. 16 great quilts- all very different from each other using a wide range of techniques, different colour palettes and a variety of styles from modern, folk, traditional. medallion, repetitive block quilts. Great for both beginners or advanced. Each quilt has a skill level indicater but I think the patterns are so clearly explained step by step they would be easy for anyone. Lots of tips about using colour and choosing fabrics, and how to make scraps work. Big full size template diagrams. Colouring pages of each to copy and colour in. Brilliant! Tipsy Tac Toe - I know this looks like a black and white photo of a colourful but Diane has used black and white contrasting fabrics to create this wonderful effect. Detour - There's lots of tips on how to make this quilt really work without looking messy or confusing. Oh My Stars - really shows how different fabric choices can change the look of a block to make an overall interesting and beautiful quilt. Vintage Village - Who doesn't love a house quilt! If I'd had more time to make one of the quilts from this book it would have been the cover quilt - Crazy Daisy. I would have used shades of blue and called it the Blue Mountain Crazy Daisy quilt. Scrap Quilt Secrets Giveaway winner!! A huge thank you to everyone who joined in the Scrap Quilt Secrets Giveaway. 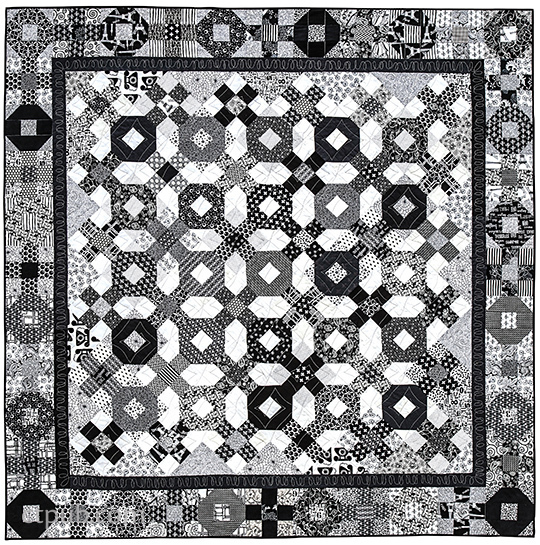 It's wonderful to think of lots of versions of Diane Knott's scrappy quilts will be made all around the world. I wish I had hundreds of books to give away but alas there can only be one..
and the lucky winner is Karen S of Sunburnt Quilts - Yay!! For those who didn't win a copy watch out for it at your local quilt shop or here's an easy link to Scrap Quilt Secrets on Amazon. It could be in your mailbox in just days. Okay - the part you've all been waiting for - the giveaway! Thanks to Diane Knott and C&T Publishing I've got a hard copy of Scrap Quilt Secrets to giveaway to anywhere in the world. For your chance to win simply leave a comment. If you'd like to answer a question tell me which was your favourite Scrap Quilt Secrets quilt from the ones I've shown. Don't forget to include an email address in your comment if you're not super sure of your reply settings. I'll leave the giveaway open until 5th April, 6pm, Blue Mountains, Australian time. I always like to reply to comments but seeing this is a giveaway post I'll thank you now for visiting my blog and I wish you a happy scrappy day!! In the meantime you've got more chances to win this great book by visiting the other blogs on the hop. Ooooh that Razzamatazz has my name all over it. Looks like a great book. This book sounds wonderful! I'd love to learn some tips on choosing color, picking fabrics and making scraps work. I'm loving the Detour and Vintage Village quilts. Hi I love the vintage village, and the crazy daisy. Looks like a great book. I like them all but I had never thought of making a scrappy village quilt so I will choose that one. Looks like a great book! I didn't know "Vintage Village" and I think it's a very Spring quilt ! I really like Razzmatazz, but my favorite is the cover quilt. I love the combination of applique and piecing. I haven't seen a quilt previewed that I don't like. They all look fabulous! Thanks for an opportunity to win a copy of Diane's book. My fav is Razamatazz, but I also really like the log cabin quilt. Thanks for participating in this giveaway, Rachael. I love scrap quilts!This looks like a fabulous book. I'm with you, I would probably make the cover quilt. After careful consideration, I think my favourite quilt is "Vintage Village". The houses are so cute and colourful, can see some of my stash fitting in that quilt very nicely. I enjoyed your notes! I love the cover of this book, though I think I'd be lazy and leave out the inner flower border if I were making the cover quilt (brilliant idea to make a Mountain Daisy version of it!). I also really like Vintage Village and Razzamatazz (though let's face it, there's no way I'd make Razzamatazz with all those little pieces. Plus curves. Not if I actually wanted a finished quilt one day!). I like the Vintage Village. This looks like a great book. Your notes were interesting. I always struggle with gettng the right scrappy mix. Sounds like she covers this in the book. I like to have tips on fabrics that could be used to create effects. I think all quilt books should have examples of the fabric used BEFORE they cut it up! Now that may not work with really scrappy quilts, but having guidance on what color, tone, hue, pattern, style would be wonderful. WWOW ! Such a great & generous giveaway ! I love the house quilt! I have always wanted to make one. Love the look of "Detour"!! Crazy DAisy, really lovely quilt, my stash is ready! I like the zig-zaggy quilt. I like those houses. Haven't done one before, and this looks like one I'd like! The cover quilt is my favorite. Thanks for an opportunity to win this great book. 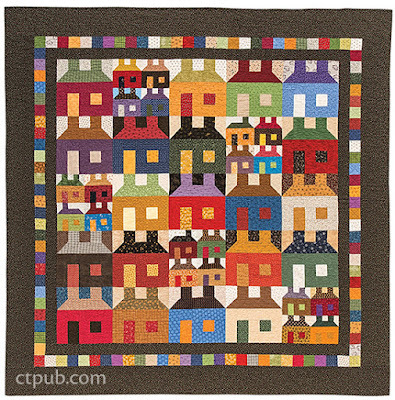 I love the vintage village quilt because all houses are not the same size. Thanks for offering a give-away. nrkozak@comcast.net. As a relative newcomer to quilting, the use of color and fabric in scrappy quilts without getting confusing or messy would be valuable information to me. Thanks for the chance to win! I love the cover quilt, but the Oh My Stars also appeals. I like Detour. But the one on the cover? I have heart eyes for that one. You are so right --- what wonderful quilts! I think, because it is probably my favorite type of quilt, I would start with the log cabin quilt. I love the variety of fabrics. However, I am quite sure I would make some of the others as well. You know I love scrappy and I the first quilt I would go for is Detour--I have lots of strips to use up! I can totally see you put your own spin on that cover quilt! I've never made a house quilt and the Village quilt caught my eye. Thanks for the chance to win such an appealing book. Razzamatazz is my favorite. I can picture it in different colors. I can just imagine your version of the cover quilt! It would be lovely. I'm sure it was hard to choose a favorite as all of these look like great fun. I love scrap quilts in general so I just can't pick one! Oh my Stars and Vintage Village caught my eye. I want to nake the cover book quikt, can't wait to get copy. I want to make Detour. Thank you for the chance to win a copy. Vintage Village. I've been dying to make a house quilt to use up my scraps! I think my favorite is Crazy Daisy, but I love a lot of the others, too! Your blue one would be so much fun. Hope you have time to make it some day! I've really been into chevron / zig-zag styles lately, so I love Razzmataz. Love Razzamatazz, but not sure I would ever accomplish it! Razzamatazz is my favorite, but also love Vintage Village, and the quilt on the cover of the book. I want to make the Detour quilt. I love log cabin and this is a really neat scrappy version of a log cabin. Thanks for the opportunity to win this book, it looks really great. I think Detour is my favorite of the quilts you've shown. Looks like a great scrappy book. I like most of the quilts I've seen from this book, but my favorite is the cover quilt Crazy Daisy. Thank you for the chance to win a copy of the book. I have recently fully embraced the scrap quilt and I love it! My favourite from the pics you showed is probably the log cabin in a streak of lightning setting. Thanks for the giveaway. The lack and white quilt is my favorite. I like to find lots of different fabrics to use for them and they all look great together. has to be about using color...so many people who want to make scrap quilts get bogged down over where to put what color...and i like the way she has the chapters titled too! terrific book! Thanks for sharing some beautiful projects! Love the "Tipsy Tac Toe" quilt>love the pattern and the color choices used! HAPPY SPRING! I have to pick Detour - it truly can use up those scraps! I'd love to win a copy of this book - it looks fantastic! I love the cover quilt - it's so very cheerful :0) Thanks for the chance! Scrap quilts of every kind are my very favorites - would LOVE to win a copy of this wonderful new book! Repetition in making scrap quilts is what I learned from Diane. Oops, meant to type Vintage Village in my earlier comment. Not sure why this is showing March 31st, as it's 1:15PM on March 30. Since I have been buying black and white prints, I think I will choose the black and white quilt!! If I free up some room in the basket, I can buy more!! For me, it's a close tie between Razzamattaz and Tipsy TicTacToe! I'd probably have to start them both at the same time! I love the first quilt picture you featured. Looks like some strings are involved, and I've been on a roll with them in my last 7-8 quilts. Thanks for the chance to win her book. That looks ike a fabulous book - I think Detour is my favourite quilt from what I can see there. Thanks for the chance. I'm always on the lookout for ways to use up those precious scraps, the cover quilt looks perfect for me! I'm terrible at picking favorites -- I love lots of scrap quilts! I agree that the coloring page for each quilt is a brilliant idea. This is the first I've heard of that in a book and I think it's a winner! I like Oh My Stars quilt! But of course I would it's girly,and I have all girls. Lol! I love Detour! 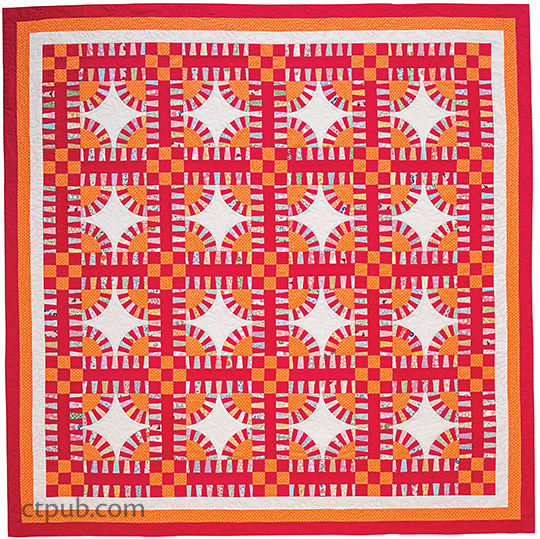 Scrappy log cabin quilts are so much fun to make! I love Detour and Vintage Village, but my favourite is the cover! Razzamatazz calls out to me but I love the cover quilt too. Great review RAchael! Mmmmm decisions....I think I'll choose Oh My Stars! Thanks for a lovely giveaway! Hard to choose between Razzamatazz and Tic Tac Toe. I can see them both in scrappy versions & I think they'd look great. Love them both. I'm so excited about this book - really looking forward to digging into many of the patterns! Thanks for the chance! I love your comments about the book, makes me want to to find where I can get a copy, WAIT I can win one here. I love the vintage houses, I've never made a house quilt and think it would be a wonderful way to use up all my precious scraps. I also love the quilt on the front cover of the book, I just might have to find where to buy a copy if I don't win one. Crazy Daisy for sure, it would help use up a nice variety of scraps and I love the applique on it. Thanks for the chance to win. I would have to say "The Detour." Love log cabins! I want to make the cover quilt! The colors and flowers are perfect. I'm new to scrap quilting and this book sounds perfect for me. Thank you for your book review. I love the cover quilt! I LOVE the quilt on the front cover. It's awesome and so is the book. Thanks for all the work you good ladies do for the quilting world. I really like the houses quilt-so cute! Looks like a book I need to add to my collection! My fav is Razmatazz. That house quilt is calling my name! I love the cute houses!! thanks!! I love Detour. I've seen pictures of this quilt quite a few times & have been thinking about trying to make it. I actually love all of the quilts you showed. I think Detour is very striking and a great use of scraps either multicolored or a more controlled palette. Vintage Village also looks like fun. Love the vintage village and the crazy daisy cover quilt. Thanks for sharing!! I think Oh my Stars would be the perfect one to make with my group of newbie quilters in our quilt ministry group. A super learning experience for all of us about how fabric choices can totally change the look of the block. I need help using my scraps and this book will be a great help! I love the Crazy Daisy quilt! It would be the one that i would sew first from Diane's book. Razzmatazz does it for me! Thanks for the giveaway! I like Razzamatazz, but Detour is interesting also. Hard choices. Oh My Stars catches my attention. So much movement. I love Detour because I love log cabin quilts. I'm with you. I would make the quilt on the front cover first. I do like the other quilts but this one draws me in right away. Thanks for the great giveaway. I like vintage village he best! Thanks for sharing the giveaway. I love everything I've seen from this book! Would love to win a copy! scrappy quilts are my favorite. Thanks for a chance to win Scrap Quilt Secrets! Detour is my favourite, love that teally green unifying square. Each day as I read each bloggers comments about the book, my desire for it grows. If I don't win, it will go on my book wish list. The thought that I could make a scrappy quilt WITHOUT it looking confusing and messy, sounds an awesome idea to me. I can understand you loving this book, it being so bright and cheerful. It is hard to pick a favourite, so I will say both Topsy Tac Toe as I've heaps of black and white fabrics and Detour, as I've never made a log cabin quilt and it uses a huge variety of scraps. Thanks for the opportunity to try for,the giveaway. My very favourite would have to be the cover quilt- crazy daisy. It draws me in every time i see it. Thank you for hosting this blog hop. I think Detour looks lovely. I love seeing all of these beautiful quilts. Love the quilt on the cover! Actually, love them all. I love scrappies! My eye is drawn to the "Detour" quilt plus I like the way it uses lots of leftover strips. It is hard to decide on one favorite. I'm choosing Detour. Log cabin quilts are always great to make as a leader quilt, the scraps really show up and lastly the log cabin quilt reminds of warmth and comfort on a cold night. I'm thinking about that "Detour" or the "Crazy Daisy". Thank you for the opportunity to win. Hi Rachael. I love black and white so I will say Tipsy tac toe. But I also love the house quilts. They are so colorful. Hi, Thanks for the great review...I love scrap quilts, they are my favorite to look at, all unique! I love the scrappy house quilt, would love to make one. Detour looks like something I'd like to make. Razzamatazz is my favorite quilt because it has red in it! Also, lately I've been thinking about making a NY Beauty like this so it was validation when I saw the picture of it the first time. I'm with you on the crazy daisy quilt, bit I'd add some tulips into the mix to make it my own. Love black and white quilts with a pop of colour also. Oh My Stars! It's lovely! For years I've wanted to make a house quilt, "Vintage Village" is just what I've been looking for. What a great book! I like them all but will select Vintage Village. Sounds (and looks) like a great book. I need inspiration to use up all my scraps! Thanks for your review, Rachael. There are many books on the market so it is good to read a review about the book. Thanks so much for this information. I am also quite taken by the cover quilt. Love the combination of piecing and applique. I love the little houses (must make), and the cover quilt is amazing. I am impressed you could go thru that book and pick out those quilts. Good job. I think the Detour Quilt is intriguing. The way so many different scraps work to create an integrated whole is amazing. Thank you for offering this give away. 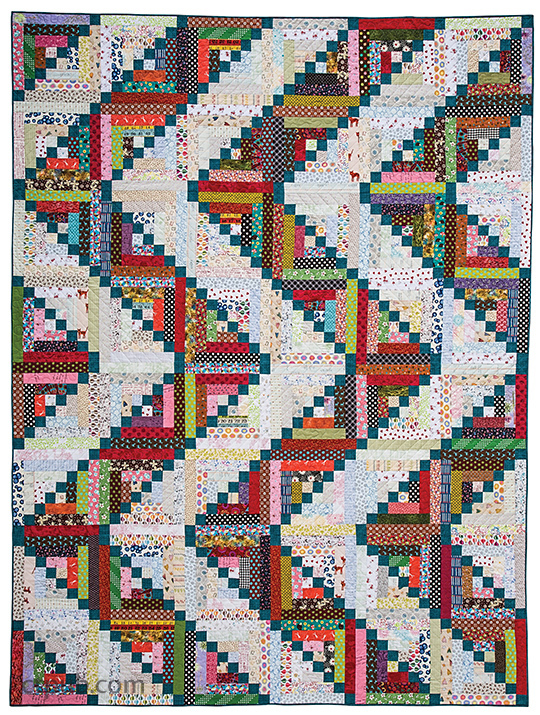 Like all the quilts you've shown but I love Detour the best. Thanks for the opportunity to win such an awesome book! They are all beautiful quilts but Razzmatazz is my favorite. Thanks for a chance to win a copy of the book. It looks like a wonderful book. I think Detour is my favorite. I love log cabins and this spin on them is very special. Awesome! I have scraps coming out of my ears so this would be a great book to have. Tips and tricks I could use too:). And full size templates are always nice! If you find the time I'd love to a crazy daisy quilt someday!!! I love this book! I'd love to make all of the quilts you've shown, but I'd definitely begin with the Crazy Daisy cover quilt as well. It's just so cute in all of its bright and beautiful glory!!! I like the cover project too, I guess that's why they made it the cover! 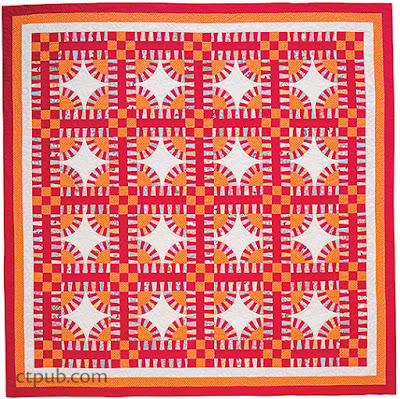 I like the brights in Vintage Village and the pattern in Tipsy Tic Tac Toe. Thanks for participating in the blog hop. It looks like a wonderful book. I was pretty intrigued with Detour. But honestly, they were all inspiring. Thanks for the chance to win this wonderful book. The cover quilt is my favorite from this book. It's definitely on my bucket list! I've never finished a quilt with houses (yet), I'm sure that the vintage village would be the first one I'd want to make, or the cover quilt. Both are colorful and look like great fun to create. Thanks for participating in the giveaway. I love both Detour and the cover quilt and would have a very difficult time deciding which to make first! I love the Tipsy Tac Toe the best, although they are all stunners to me. Thanks as always Racheal! 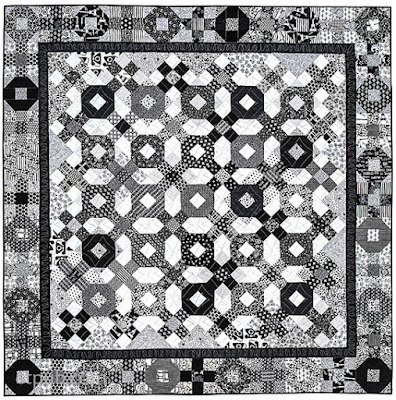 Oh my goodness that black and white quilt is amazing. It seriously could be a black and white photo. Detour and the cover quilt do it for me. Thanks for the chance to win. The one that caught my eye immediately was the black and white one! Beautiful. My goodness...lots of your fan think they need this book, just like me! I have just joined the scrap world. What a wonderful world it is, too! Detour is my favorite. I've always been drawn to log cabin quilts. Definitely love a house quilt! Looks great in solids especially! I am crazy about her Crazy Daisy quilt. And I know that the Oh My Stars quilt would make a wonderful gift for my college-bound niece. I could use some help on controlling the chaos in my scrap quilts. It looks like this would be a good book for doing that. I liked Detour the best. Thanks for the chance at your giveaway. They all look great and fun to make. But the description of Detour, "There's lots of tips on how to make this quilt really work without looking messy or confusing," is calling to me. Thanks so much for the chance! Sounds like a wonderful book. My favorites are Crazy Daisy and Detour. I love Vintage Villages and would like to make it. Oh my, Crazy Daisy is my favorite. I love daisies and half square triangles!! I love the Oh My Stars - but I love most quilt patterns that are star or flower-based. My favorite is Vintage Village. Thanks so much!!!! I love Detour- the use of the light fabrics is so striking! I would love to learn more about choosing fabrics for scrappy quilts. Thank you! Hello, Je ne vois que des belles choses présentées, ici, des chef d’œuvre de création, des univers colorés qui ne peuvent apporter que du bonheur , d'abord à ceux qui les ferons, et puis ensuite à ceux qui les recevrons. Il y a beaucoup à apprendre de ce monde, peuplé d'artistes si touchants, si doués. what a fab book - seems I'm always a day late these days !! love that Razzamatazz - its gorgeous !! !